I am always searching for a way to provide support for students who struggle. How can I build in scaffolds to help them feel successful and help them to gradually become more independent with their reading and writing? One strategy that I have found helpful is the use of sentence frames. Sentence frames are where you provide a type of sentence starter to offer structure for students to describe an idea, explain their thinking, or to simply organize topics and share information. I wrote about sentence frames here. As I work with students on narrative summaries (literature standard 2), I find that they really need an organizing structure to get them started. By no means do all students need this, but my reluctant students welcomed an organizing tool to explain the stories that they were reading. I brought in a book of Mad Libs and we simply partnered up and played the game. After two rounds of Mad Libs, I introduced the chart to the students. We used it collaboratively to summarize a few well-known fairy tales. 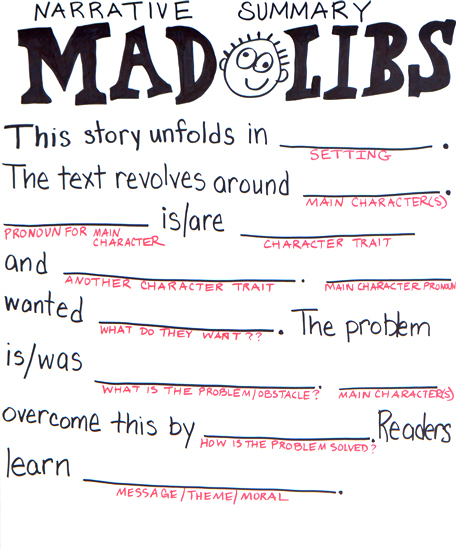 The next day, we shifted our focus and students began using the Mad Libs chart to organize their own summaries about their independent reading. I introduced this chart with a group of fourth graders and with a group of sixth graders. Both age levels were engaged and they loved it! If you try this out with your students, share your experiences with me and let me know how it went! As the year continues, I hope that parts of the chart can be covered and eventually the entire chart can come down for all students. I have been empowered reading your site. I am at the bottom when it comes to any form of technology. I am excited about joining the # communities and preparing my students for college. Will present your PowerPoint at our next ELA collaboration. Love your info on common core textual evidence. Signing up for ore more computer classes. Yea! Leave a Reply to Carrie C. Lovett Click here to cancel reply.